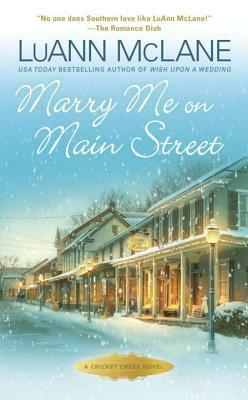 Reading Marry Me on Main Street made me feel like I was cuddling up with a mug of hot chocolate because it was so sugary sweet and full of Christmas cheer! If you looking for a charming novel with a fluffy romance and little to no angst, then this is the book for you! I was definitely in the mood for that, so this book really hit the spot for me. One of the things I loved about this book was the setting. The town that this book takes place in is simply adorable. With the scenery the author described and the townspeople, it sort of reminded me of Starshollow from Gilmore Girls . The town was so quaint and charming! I would love to live there and interact with all of the interesting people that inhabit the town. I was happy that there were even some chapters told from the POVs of some of those townspeople! The two main characters, Danny and Susan, were simply adorable. I thought they made such a precious couple. They were both so cute and almost dorky around each other. Susan was shy and sort of quirky, and I loved how Danny found those attributes to be adorable. Danny was charming and so swoon worthy. He charmed the pants off of me. I could go on and on about how cute of a couple Susan and Danny made. I really enjoyed watching their relationship develop. My main complaint with their relationship is that I felt like they got to the "I love you" stage a little too early. I would have preferred to see that later in the book. I was pleasantly surprised with this book. I wasn't expecting this book to be as addictive as it was. There was just something so captivating about the author's writing. I felt like everything from the dialogue to the description of the shops in the town pulled me in. However, some of the scenes and storylines in this book did feel a little redundant. For example, Danny "saved" Susan so many times that it started to become a bit ridiculous. I thought it was cute the first time, but I thought it became almost predictable and it started to loose its charm. Some of the chapters were a little slower than others, but I still could not put this book down! Overall, I thought this was a sweet and charming novel. If you are looking for a cute romance novel with set in an idyllic small town, then this is the book for you!